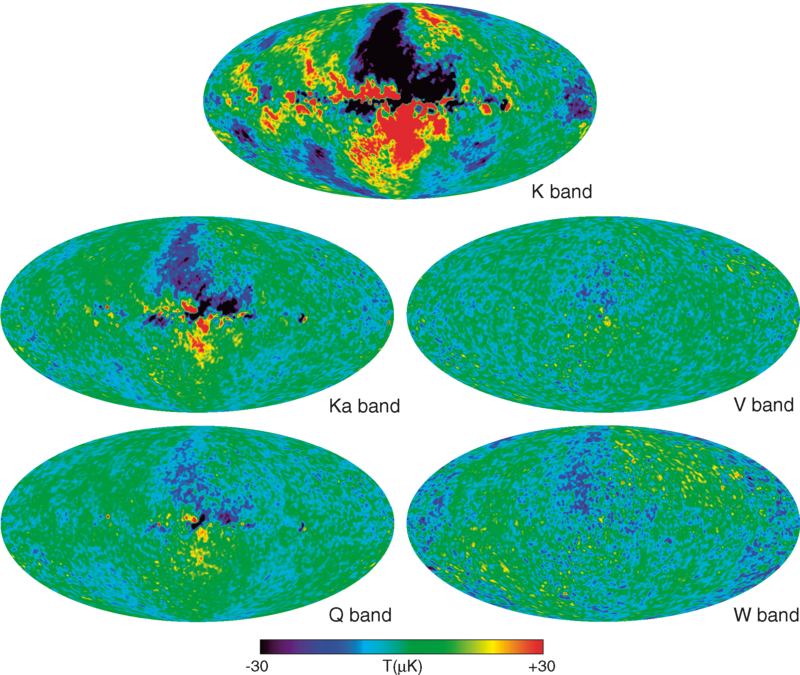 WMAP Five-year Paper Figures, Hinshaw, et al. 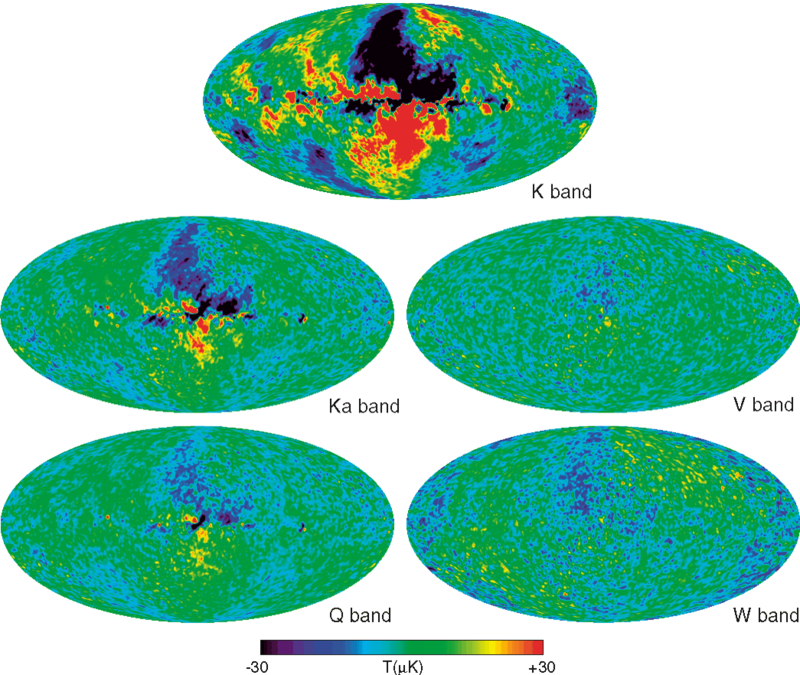 Five-year temperature sky maps in Galactic coordinates smoothed with a 0.20 Gaussian beam, shown in Mollweide projection. top: K band (23 GHz), middle-left: Ka band (33 GHz), bottom-left: Q band (41 GHz), middle-right: V band (61 GHz), bottom-right: W band (94 GHz). Five-year Stokes Q polarization sky maps in Galactic coordinates smoothed to an effective Gaussian beam of 2.00, shown in Mollweide projection. top: K band (23 GHz), middle-left: Ka band (33 GHz), bottom-left: Q band (41 GHz), middle-right: V band (61 GHz), bottom-right: W band (94 GHz). 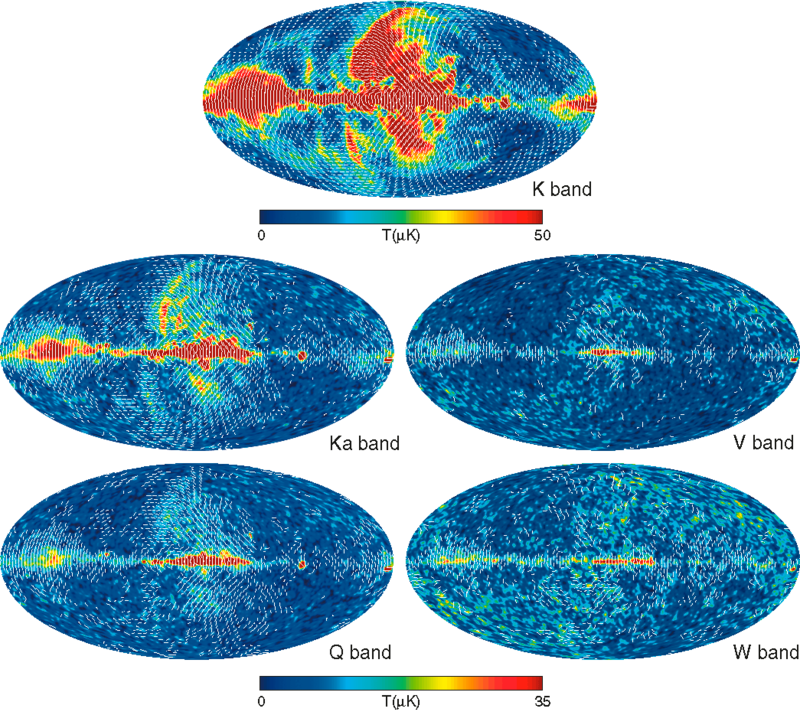 Five-year Stokes U polarization sky maps in Galactic coordinates smoothed to an effective Gaussian beam of 2.00, shown in Mollweide projection. top: K band (23 GHz), middle-left: Ka band (33 GHz), bottom-left: Q band (41 GHz), middle-right: V band (61 GHz), bottom-right: W band (94 GHz). 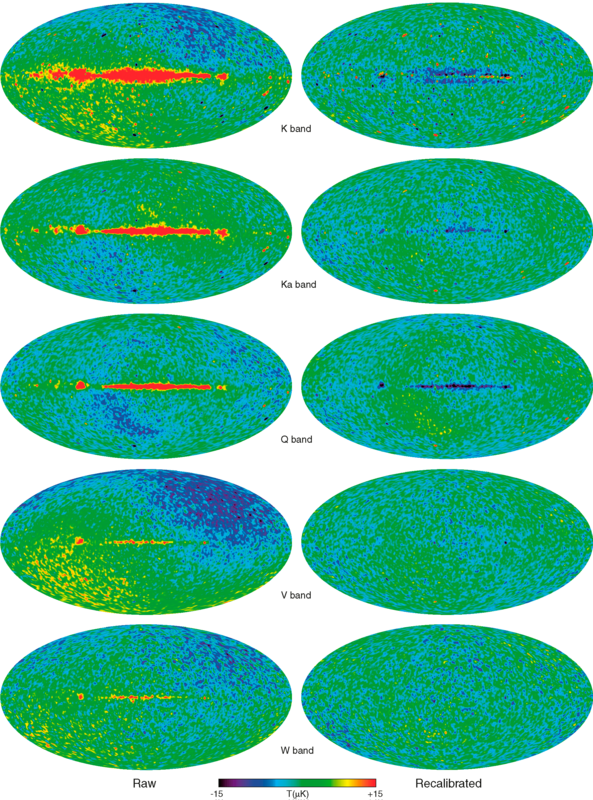 Five-year polarization sky maps in Galactic coordinates smoothed to an effective Gaussian beam of 2:00, shown in Mollweide projection. The color scale indicates polarized intensity, P = √Q2 + U2, and the line segments indicate polarization direction in pixels whose signal-to-noise exceeds 1. top: K band (23 GHz), middle-left: Ka band (33 GHz), bottom-left: Q band (41 GHz), middle-right: V band (61 GHz), bottom-right: W band (94 GHz). Difference between the 5 year and 3 year temperature maps. left column: the difference in the maps, as delivered, save for the subtraction of a relative ofset (Table 3), right column: the difference after correcting the 3 year maps by a scale factor that accounts for the mean gain change, ~ 0.3%, between the 3 year and 5 year estimates. top to bottom: K, Ka, Q, V, W band. The differences before recalibration are dominated by galactic plane emission and a dipole residual: see Table 3, which also gives the changes for l = 2,3. 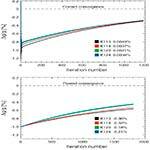 Gain convergence tests using the iterative sky map & calibration solver on a pair simulations. 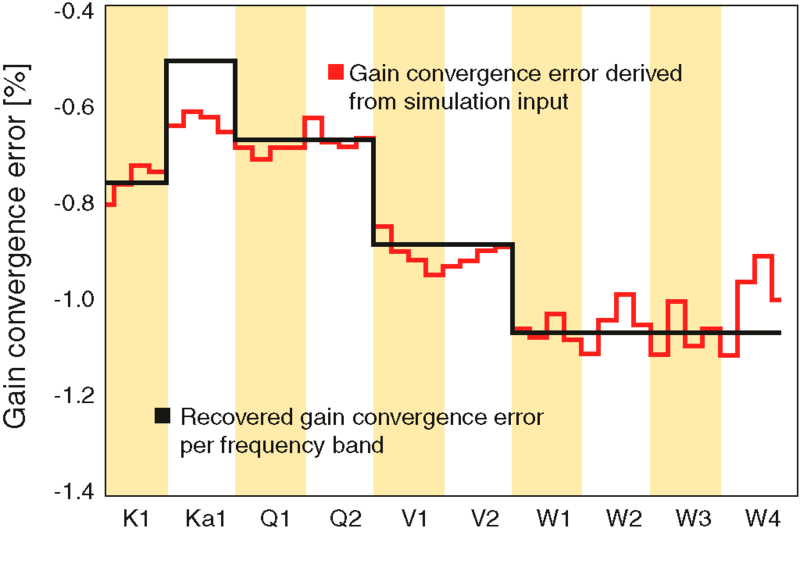 Both panels show the gain recovery as a function of iteration number for a 4-channel K band simulation. The initial guess was chosen to be in error by 1% to test convergence; the extrapolated output solutions are printed in each panel. top: Results for a noiseless simulation that includes a dipole signal (with Earthvelocity modulation) plus CMB and foregound anisotropy (the former is evaluated at the center frequency of each channel). The input gain was set to be constant in time. The extrapolated solutions agree with the input values to much better than 0.1%. 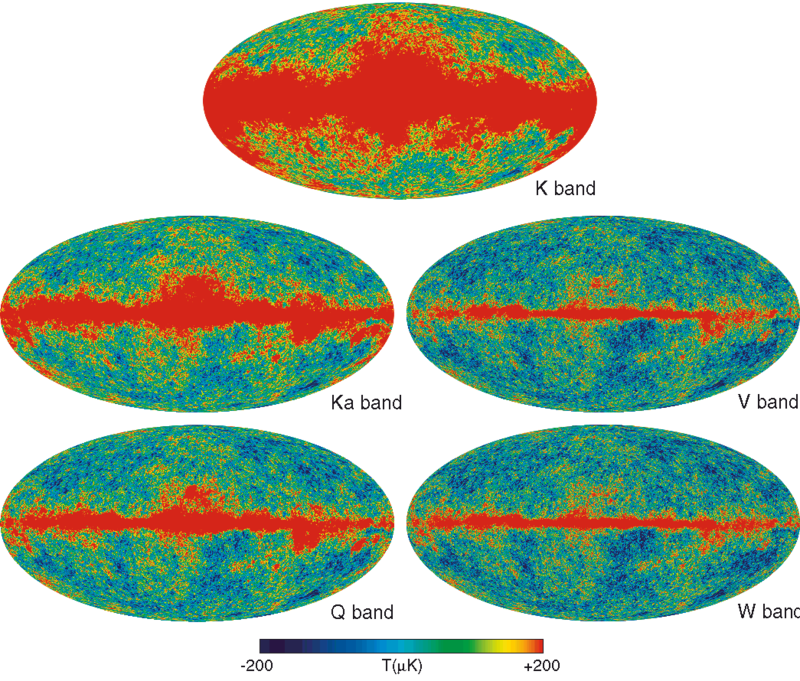 bottom: Results for a noiseless simulation that includes only dipole signal (with Earth-velocity modulation) but no CMB or foreground signal. In this case the input gain was set up to have ight-like thermal variations. The extrapolated absolute gain recovery was in error by >0.3%, indicating a small residual degeneracy between the sky model and the time-dependent calibration. Gain error recovery test from a ight-like simulation that includes every effect known to be important. Using the daily dipole gains recovered from the iterative sky map & calibration solver as input, the gain convergence error, shown here, is fit simultaneously with the gain model parameters, not shown, following the procedure outlined in Appendix B. The red trace indicates the true gain error for each WMAP channel, based on the known input gain and the gain solution achieved by the iterative solver on its final iteration. The black trace shows the gain error recovered by the fit, averaged by frequency band. The channel-to-channel scatter within a band is <0.1%, though the mean of Ka band error is of order 0.1%. 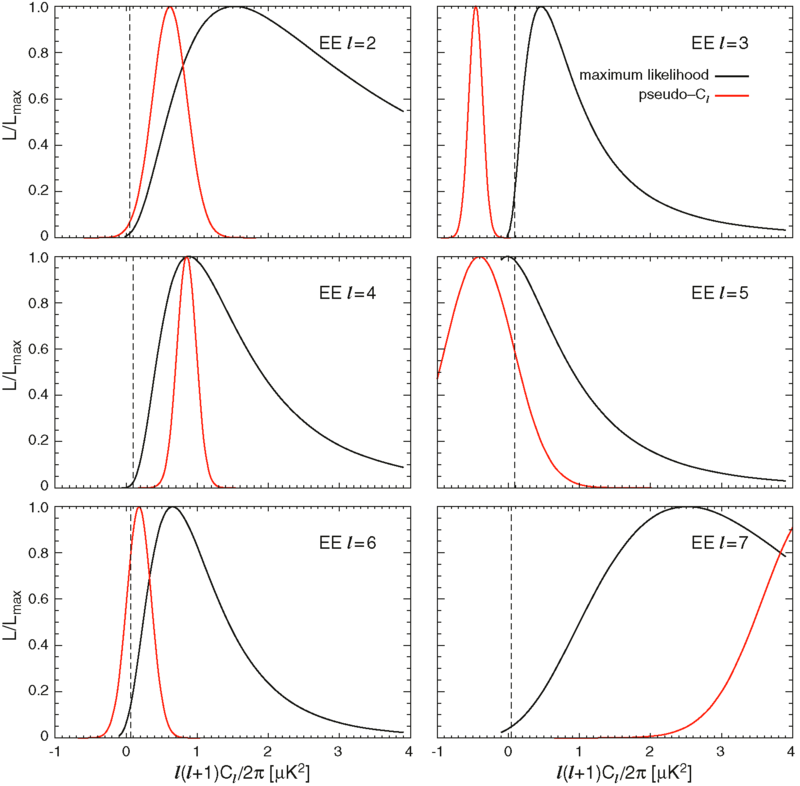 W band EE power spectrum likelihood from l = 2 - 7 using two separate estimation methods: black: maximum likelihood and red: pseudo-Cl. The vertical dashed lines indicate the best-fit model power spectrum based on fitting the combined Ka, Q, and V band data. The two spectrum estimates are consistent with each other, except at l = 3. The maximum likelihood estimates are wider because they include cosmic variance whereas the pseudo-Cl estimates account for noise only. 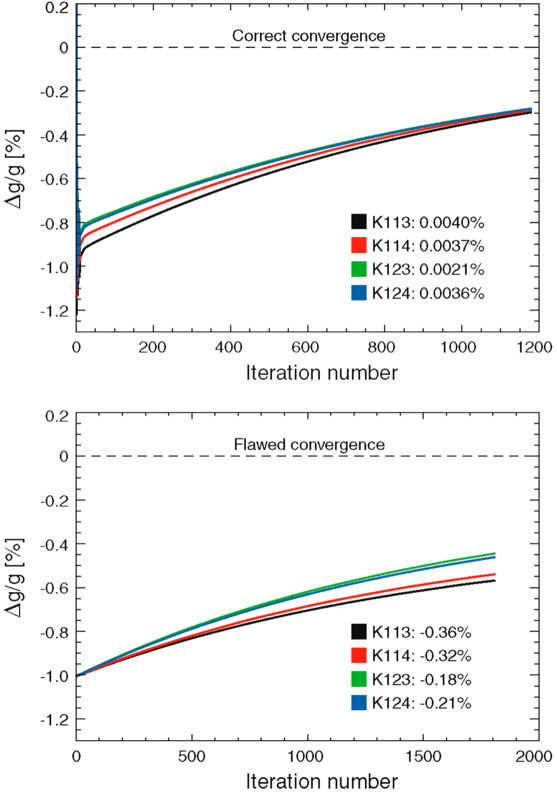 Both estimates show excess power in the W band data relative to the best-fit model, and to the combined KaQV band spectrum, shown in Figure 6 of Nolta et al. (2008). The extreme excess in the l = 7 pseudo-Cl estimate is not so severe in the maximum likelihood, but both methods are still inconsistent with the best-fit model. top: Simulated W band data with a large polarized thermal emission signal injected, binned by solar azimuth angle. The red trace shows the input waveform based on the flight mirror temperature profile and a model of the polarized emissivity. The black profile is the binned co-added data which follows the input signal very well. The thickness of the points represents the 1 σ uncertainty due to white noise. bottom: Same as the top panel but for the 5 year flight data. The reduced χ2 of the binned data with respect to zero is 2.1 for 36 degrees of freedom, but this does not account for 1/f noise, so the significance of this result requires further investigation. 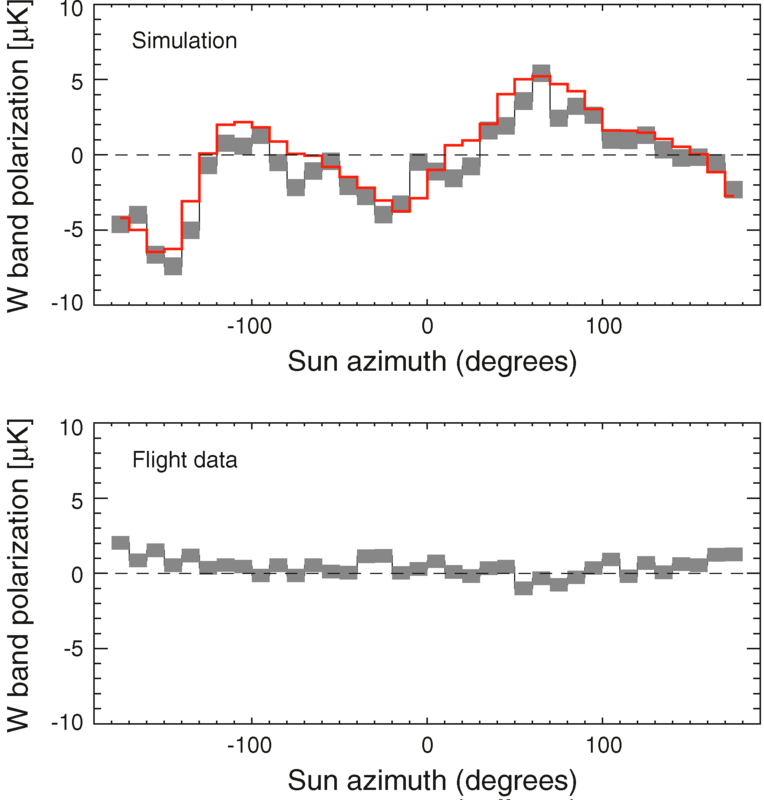 However, the much larger signal in the simulation did not produce an EE spectrum with features present in the ight W band EE spectrum, so the feature in the binned flight data cannot account for the excess l = 7 emission. 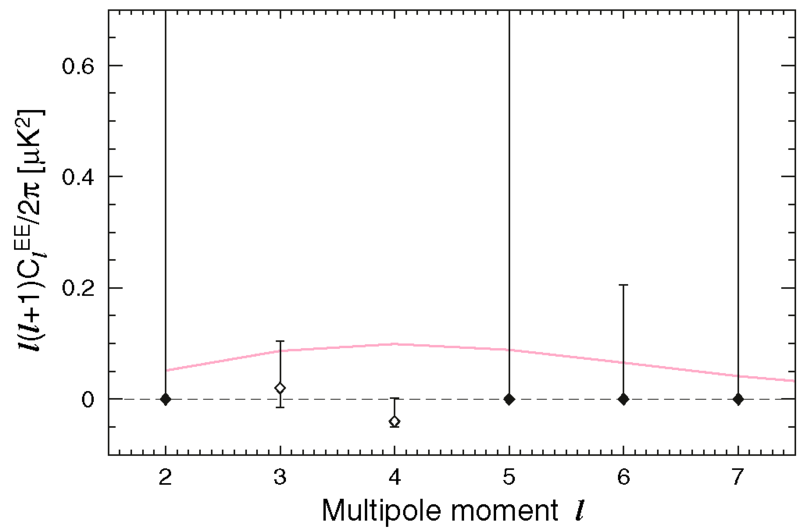 The EE power spectrum computed from the null sky maps, ½SKa - ½SQV, where S = Q,U are the polarization Stokes parameters, and SQV is the optimal combination of the Q and V band data. The pink curve is the best-fit theoretical spectrum from Dunkley et al. (2008). 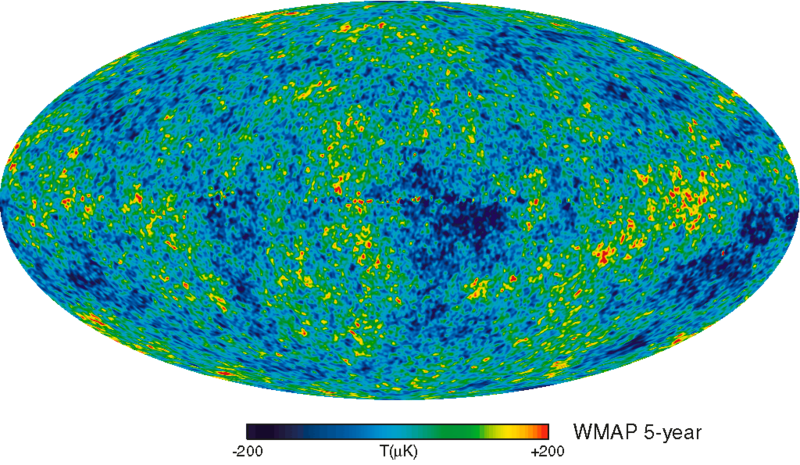 The spectrum derived from the null maps is consistent with zero. Estimates of the optical depth from a variety of data combinations. 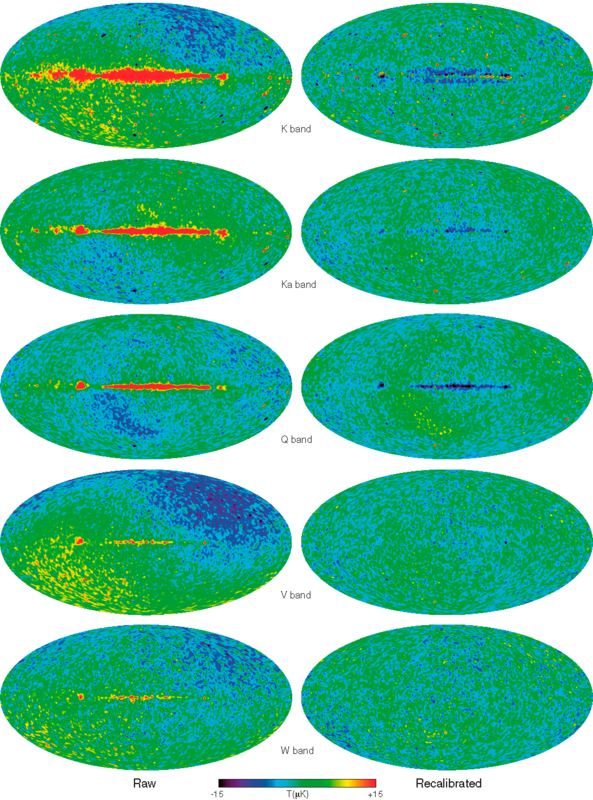 The dashed curve labeled Null uses the same null sky maps used in Figure 10. 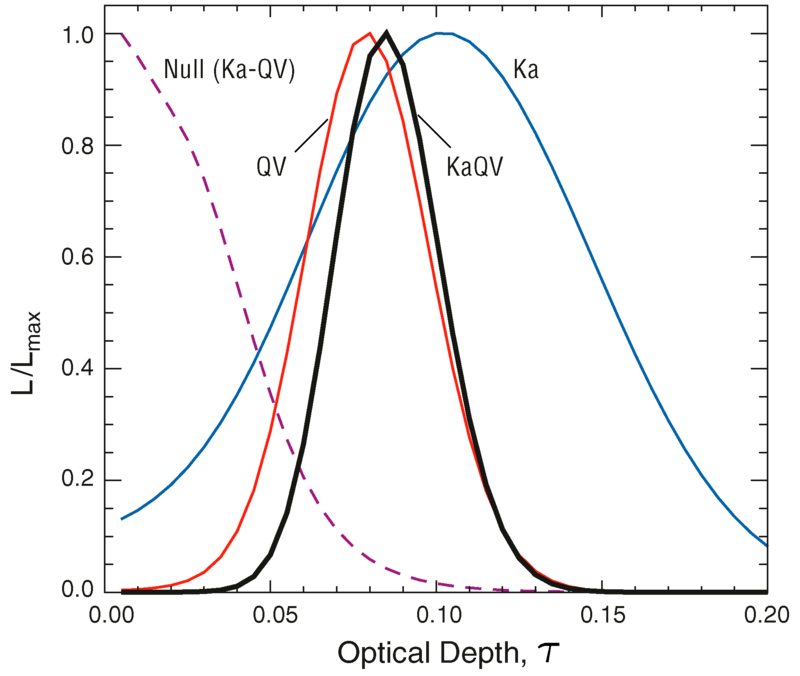 The optical depth obtained from Ka band data alone (blue) is consistent with independent estimates from the combined Q and V band data (red). 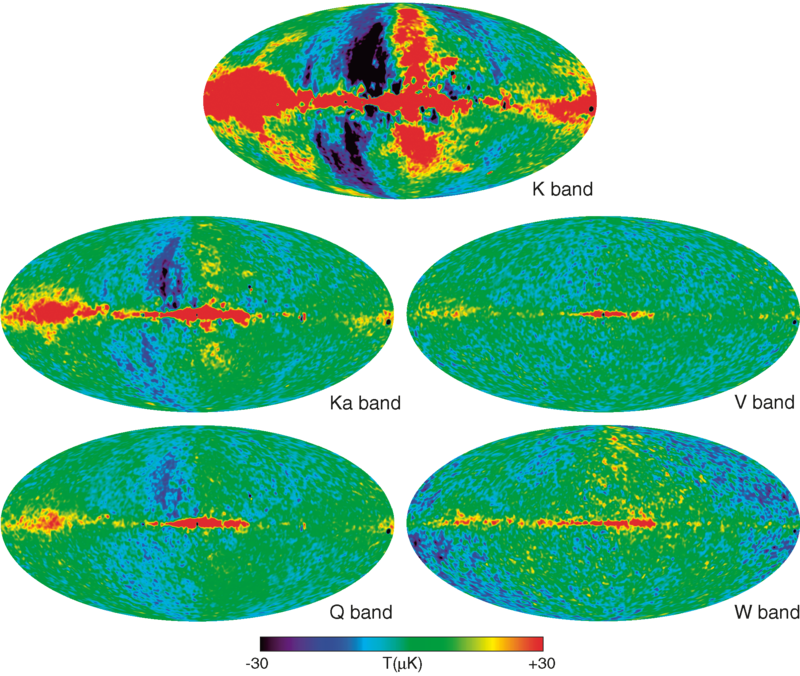 The final 5 year analysis uses Ka, Q, and V band data combined (black). These estimates all use a 1-parameter likelihood estimation, holding other parameters fixed except for the fluctuation amplitude, which is adjusted to fit the first acoustic peak in the TT spectrum (Page et al. 2007). 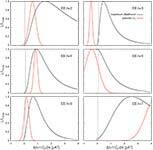 The degeneracy between τ and other ΛCDM parameters is small: see Figure 7 of Dunkley et al. (2008). The temperature (TT) and temperature-polarization correlation (TE) power spectra based on the five year WMAP data. 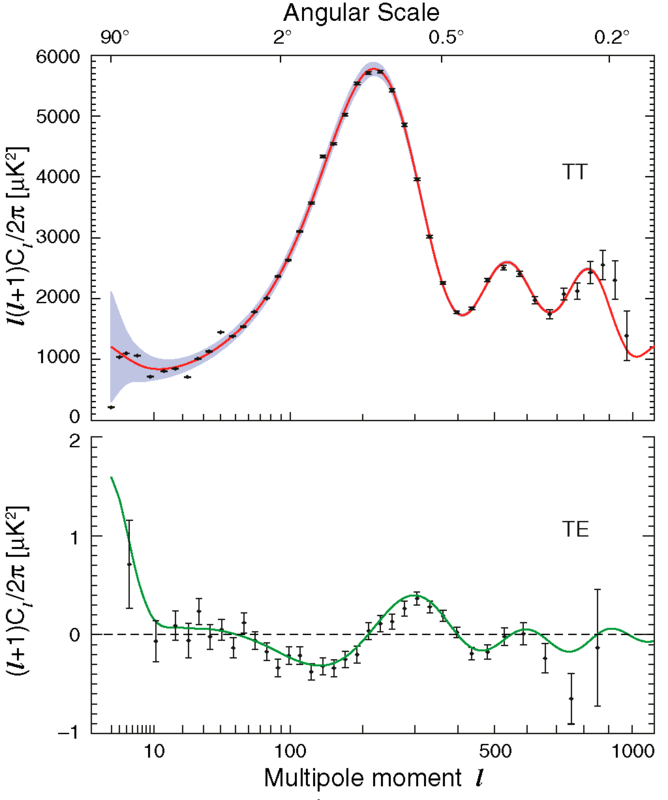 The addition of two years of data provides more sensitive measurements of the third peak in the TT and the high-l TE spectra, especially the second trough.